Read about how Millennials are knocking it out of the park! Did you and your partner have the “money talk” before getting married? More than half of millennials discussed finances with their partner before they got married, according to a recent SunTrust survey. 44% of couples aged 18-34 had at least one conversation about debt, compared to just over a third of boomers (aged 55-64). This pre-wedding transparency is just one of the ways that millennials are handling their financesmore intelligently than their parents. Taking a closer look at how millennials manage their money can help every generation handle their finances smarter. A recent survey by TD Bankrevealed that 86% of millennials are comfortable discussing money, compared to just 74% of gen Xers and 79% of baby boomers. Millennials are more willing than other generations to talk openly with their partners about many financial issues, including their annual salaries, retirement savings, debts, and buying a house. Almost all millennial couples (97%) talk about their finances at least once a month, while just 88% of couples across all age groups can make that claim. Three out of four millennials in committed relationships discuss money every week. 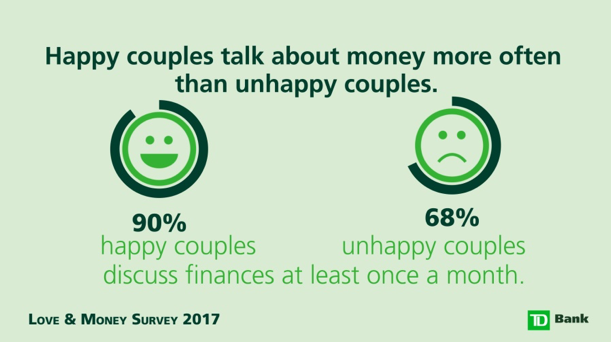 This openness about finances seems to improve happiness in a relationship - nearly nine in ten millennials report being very or extremely happy in their relationships. More than half of this age group (57%) considers themselves disciplined or highly disciplined financial planners compared to 49% of gen Xers and 45% of boomers. Despite their attention to planning, 82% of those aged 18-34 say their financial planning needs improvement, compared to 63% of boomers and 79% of gen Xers. Three out of four millennials worry that they have not found the right balance between current and future financial responsibilities. Despite stereotypes that paint millennials as foolish spenders, Bank of America’s 2018 Better Money Habits Millennial Reportreveals that members of this generation tend to be solid savers and budgeters. 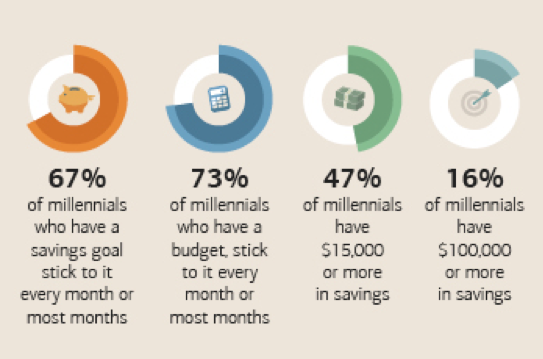 More than half of millennials (54%) say they have a budget, and 73% of millennials who have a budget meet it. This focus on financial planning is paying off in a major way. 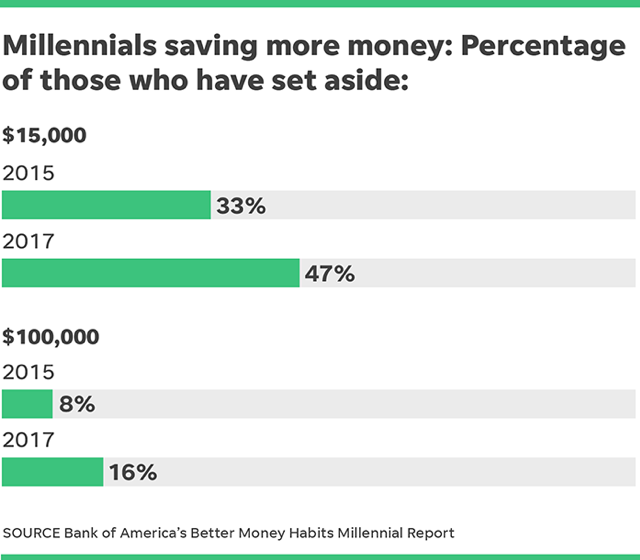 Over two-thirds of millennials who have a savings goal meet it, one in six millennials has over $100,000 in savings, and nearly half (47%) have $15,000 saved. Talking about finances openly with your significant other can make you happier and improve your relationship. If you are in a committed relationship, share inventories of your assets and debts, and resolve to discuss finances on a regular basis. When partners are comfortable discussing finances, they are less likely to feel like they are bearing the financial burdens alone. 29% of millennials say that financial planning makes them feel “excited and inspired,” compared to just 22% of Gen Xers and 12% of Boomers. That may be why millennials are out-saving other generations. Looking at financial planning as an inspiring way to reach your goals rather than a chore may make it easier to stick to a budget. Whether you need tips on personal financial planning for millennials, advice on age-appropriate investments for gen Xers, or social security strategies for boomers, meeting with a financial planner can be helpful. Gaining expertise in finances is empowering for every generation, and having a written financial plan makes it more likely you will achieve your savings goals. If you would like help handling your finances, consider reaching out to skilled financial planner Matt Logan at www.mattloganinc.comor call us at 336-540-9700.